Home > Hookin on Hump Day > Hookin On Hump Day #81: Link Party for the Fiber Arts! 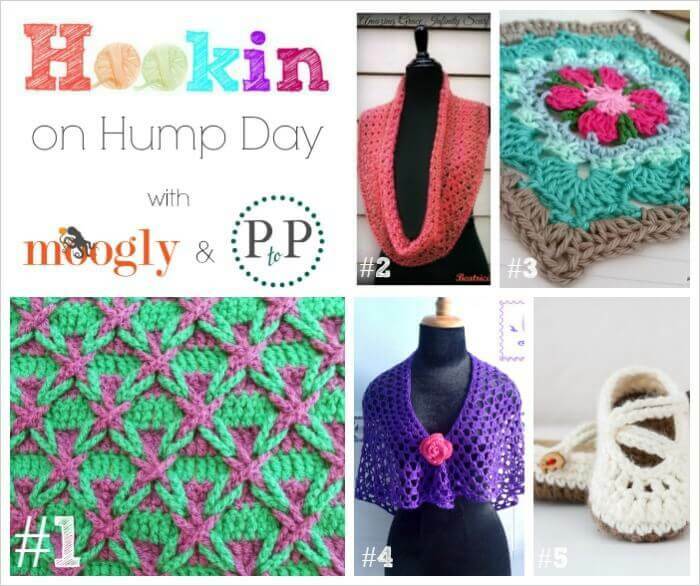 Hookin On Hump Day #81: Link Party for the Fiber Arts! Welcome!! I’m so excited to be cohosting my first Hookin on Hump Day party with my lovely friend Tamara from Moogly! Sara from My Merry Messy Life started this fantastic link party, and I’m honored to be picking up the hook (errr, I mean torch) and carrying it forward. I am hoping this will be a wonderful opportunity for you all to browse through the latest and greatest in the fiber arts world, find new patterns and designers, share your own knit and crochet projects, and perhaps find your next project while you’re here! If you are new to Hookin on Hump Day, let me give you the scoop … the party is hosted both here at Petals to Picots and at Moogly – the links will show up on both sites and we both promote the featured projects on Facebook, G+, Pinterest, and more. Click on the names of the patterns you like to go to their pattern pages! #1 – MOST CLICKED: Polish Star Pillow by My World of Crochet: Isn’t this amazing? You can run the page through Google Translate, and though the written instructions aren’t included, studying the photos is a big clue as to how this pattern is achieved! #2 – Amazing Grace Infinity Scarf by Beatrice Ryan Designs: Lovely and FREE crochet pattern! #3 – Mood Blanket October Square by Pukado: She’s done it again, and it’s a FREE crochet pattern! #4 – Purple Glam Shawl by Maz Kwok’s Designs: Lovely and feminine FREE crochet pattern! #5 – Double Strapped Baby Mary Janes by One Dog Woof: Cute and pretty and a FREE crochet pattern! Congratulations!! Feel free to grab your I’ve Been Featured button and show off. I’ll be pinning you on my Pinterest Board and featuring you on Facebook and Google+, as will Moogly! I can’t wait to see what you’ve made now! You don’t have to be a designer or a big name blog to join this link party – all you need is to have a post about a crochet or knitting project you did that you’d like to show off! Remember, this party is in RANDOM order, so there’s no such thing as being late. New to the Hookin On Hump Day party? To receive reminder emails twice monthly about the party, enter your email here. Otherwise, I won’t pester you if you’d rather not receive a reminder! Looks really fun, this colourful party! This is my first time publishing here, my weblog is in Dutch but no words are needed to show those crocheted goodies…and there’s always Google translate avalaible if you do want to know everthing about the patterns. What a fun party! I’ll have to pick up my hook so I can join in! I am a long time follower of your blog and on pinterest too.